A: Check-in is anytime after 3pm. If you will be arriving prior to 1pm, early check-in can be purchased for $59. Early check-in is based on availability and if the condo is ready. A: We understand if you need to arrive later in the day – that is not a problem. We don’t make you check in with anyone or stop by an office to pick up keys. You can access your vacation home anytime after 3pm as per your instructions email to you. We have lock boxes on our Maui Kai condos and also on the Hale Mahina condo. Papakea and Mahana have a lock with the six digit code you are given with check-in instructions. If checking in at the Kaanapali Alii Resort, the front desk is staffed 24 hours/day for key card pick-up. A: Check-out time is 11am. A: Late check-out is based on availability. There is an additional fee for late check-out ($75 until 3:00pm and $100 until 7:00pm). It is based on when the next person will be checking in. We will not be able to reserve a late check-out in advance. The only way to guarantee a late check-out is to book an additional night. 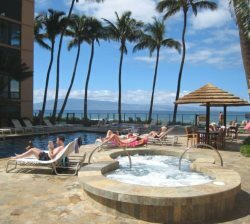 A: All of our condo Rentals are located within a few miles of each other and are located in the area of Ka’anapali, on the west side of Maui, south of Kahana and Kapalua. Please refer to our Driving Directions section for more details. A: Select a property that you like the most and then the dates you would like to vacation. Check the availability of those properties online. If they are available, you can proceed to book the property online, r email, or call us to book it! We respond to all emails within 24 hours. What is your mailing address if I need to mail you something? Packages: If you need to have a package mailed to you while staying at one of our condos, please make arrangements with us to have your package mailed to the company’s office. Please be advised that only one package per reservation will be accepted. It is the guest’s responsibility to track and pick-up the package. We are not responsible for informing guests when package arrives nor do we guarantee the contents of your package. What do I do if my luggage is lost? A: 50% deposit on the total rental is required to book your stay with us. The balance is due 30 - 45 days prior to check-in. We accept all major credit cards, debit cards and e-check payment (except AMEX). A: After you have paid in full, and 14 days before your arrival, we will send you the driving directions and check-in information to your vacation rental property by email. If you don't have your information within 7 days of the stay at the property, please contact our office so we can re-send it to you. A: Should the need arise to cancel your reservation prior to 60 days of your arrival, regardless of reason (including bad weather, illness, or economic factors), you will receive a full refund minus the $125 non-refundable booking fee. Cancellations within 60 days will receive no refunds. There are no refunds for late arrivals, early departures, or for leaving the condo for mechanical failure of non-essential items. A: Your property should be cleaned to your satisfaction when you arrive. Cleaning is included in your rental price. Please remove your garbage, load and turn on the dishwasher, secure all doors and windows, and double check the safe for any personal items. However, should the cleaning of the property exceed the hours expected, you will be charged $30 per hour from your credit card on file for any extra time it took to clean the property. A: Whatever will make your vacation one of a lifetime! All of our properties are equipped with a full kitchen. If a previous guest has left basic cooking supplies (oil, seasonings, etc. ), we will leave these for the next guest; however, we don’t replenish them. We provide basic amenities and there are some beach supplies in each condo. Our vacation condos are stocked in such a way that you always feel like you are coming "home" to your "vacation home" rather than returning to a small hotel room. Our homes have full kitchens, with some homes having game rooms, hot tubs and BBQ grills. You will be able to enjoy a full service home while you are on vacation rather than a small, cramped hotel room.